Our cinnamon spiced cake filled with apple pie filling topped of with a simulated scoop of vanilla ice cream. If you close your eyes it will taste just like eating a slice of apple pie with a scoop of vanilla ice cream. A classic‏ dessert of yellow cake with custard(bavarian cream) filling topped off with chocolate icing. Our moist‏ white cake with smooth caramel buttercream filling, topped off with red caramel apple flavored buttercream. You would swear that you just bit into the most delicious caramel apple. Our delicious Carrot Walnut Cake loaded with crushed pineapple and coconut flake. Capped off with cream cheese icing and a piped carrot on top - it is hard to resist. Our delicious white cake filled with cherry pie filling, topped off with Washington Cherry flavored buttercream and a maraschino cherry. Our devilish chocolate cake filled with chocolate buttercream, topped off with Ray's Das German Chocolate Icing (translation: Ray says it is the best you will ever taste!) German Chocolate icing must be refrigerated and contains pecans. Our unforgettable chocolate cake filled and iced with whipped fudge icing. Topped with a fine chocolate decoration. A chocoholic's dream in the perfect package. Our joyous‏ gingerbread cake filled with gingerbread buttercream. Topped off with a snowcap of winter white buttercream and a gingerbread man. Our zesty lemon cake filled with lemon meringue pie filling and iced with delightfully light lemon fluff icing. 2 half‏ layers of yellow cake, filled with bavarian creme. Topped with chocolate icing. 2 half Layers of chocolate cake and 1 layer of cheesecake. Iced in buttercream and garnished with fudge icing. 2 half layers chocolate cake filled with fudge icing. Iced with buttercream. Top decorated with fudge and buttercream stars. 3 half layers chocolate cake with 2 fillings and frosted in fudge icing. 3 half layers of chocolate cake. Filled and iced with German Chocolate Icing. 3 half layers of gingerbread cake, Filled with gingerbread buttercream and iced with white buttercream. Garnished with colorful swirls and mini gingerbread men. 3 half layers Lemon Cake, 2 fillings of lemon fluff. Iced in lemon fluff Lemon Fluff Icing is made by mixing 2 parts buttercream and 1 part lemon filling. Fleckenstein's Bakery believes that we have created the best-tasting Ice Cream Cake around. We start with a layer of our delicious chocolate cake and then add your choice of a generous filling of Ice Cream. We top that with another layer of our delicious chocolate cake and frost it with whip cream icing. The cake is then garnished with Oreo crumbs. Absolutely LOVE this bakery! Everything is delicious! The Baklava is my favorite. I hate German Chocolate cake but they make me want it! I’ve been coming to Fleckensteins for over 20 years & they are fabulous! The cakes are to die for & they have the best donuts. 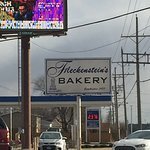 Fleckenstein's always has fresh pastries. Their seasonal frosted cookies are loved by all the kids. I have gotten birthday cakes here before, everything I have ever gotten has been delicious. 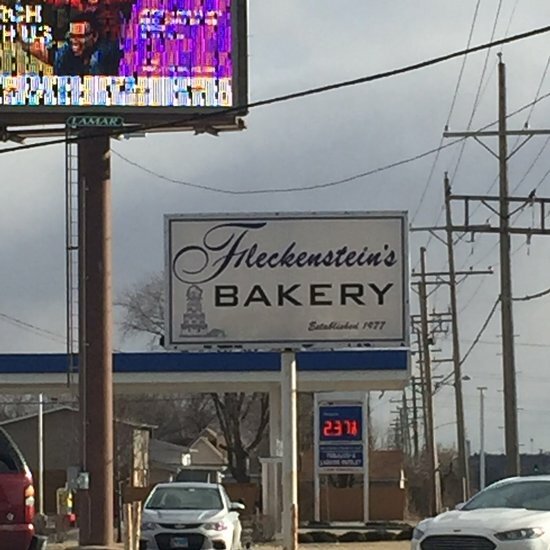 Fleckenstein's has been in Mokena for decades. They just opened up a new shop in New Lenox and I cant wait to try it. What a great bakery! Bakery hrs are short close too soon has good tasting products been here many times. Priced high but you are paying on the staff behind the counter. The service they provide and employees really hustle which is rare find. They make the best cakes and will customized to your preferences. If you want the best pastries then you have to come to this bakery. Get quick answers from Fleckenstein's Bakery staff and past visitors.